I was lucky enough to be one of the people who was invited to MozCampEU2012 in Warsaw, Poland on September 8-9, 2012. And even luckier I was able to meet longtime Thunderbird contributors for sessions about Thunderbird’s transition to being community-led in November 2012. But I’ll save that for another post. Since all Mozillians are community leaders, we need to meet our community. Not just electronically but in real life whenever we can. And not just the communities we know and love (like the Thunderbird community) but people in other Mozilla communities. Being in Thunderbird support, I have also be been involved in Firefox support. 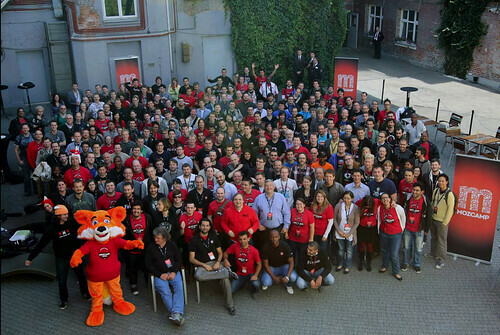 It was therefore great to meet many of the Firefox Support Mozillians in Warsaw. John99, my MozCampEU2012 buddy was one of those people I was fortunate enough to meet. In the picture above he’s in the third row from the front to right and just behind David Boswell. Despite my jetlag, we made a connection I know that will make future work together electronically even more awesome on SUMO and other Mozilla communities. Nice to make a new buddy John! Come visit me in Vancouver!